Middle grade science fiction graphic novel. Those six words = auto-read in my world. 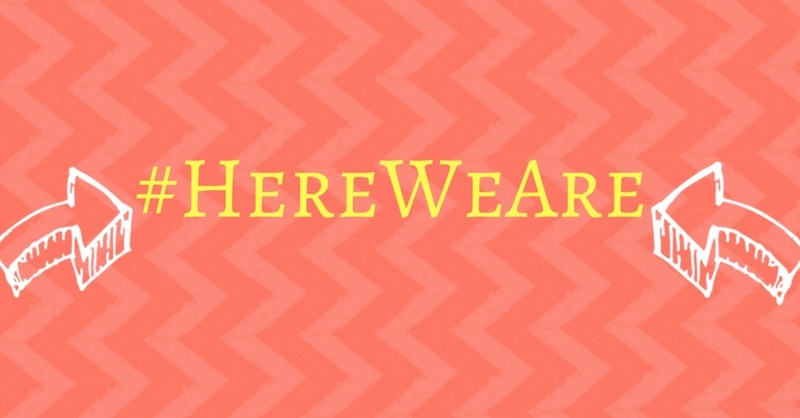 I love middle grade books, I love science fiction and fantasy, and when you put them together, in a graphic novel format? I am here for it. 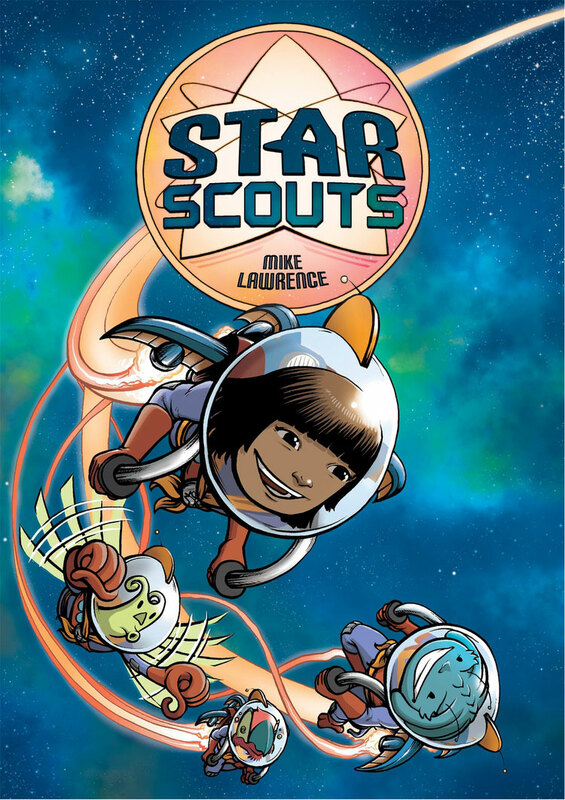 Add in a diverse girl as the main character, and Mike Lawrence’s solo graphic novel debut Star Scouts became a #1 priority in my to-be-read (TBR) pile. Avani is struggling to fit in at her Flower Scouts troup and new school when she’s accidentally teleported to alien Mabel’s spaceship as part of a Star Scouts (the intergalactic version of scouting!) homework assignment. Soon, Avani has made new friends, each with different strengths and talents, including flying and advanced robotics engineering. When Avani makes it to Camp Andromeda (real space camp) with her new Star Scouts troup, the adventures get even more intense. Will she prove that humans belong at space camp? It’ll take teamwork, friendship, and a little inventiveness to stay with her new friends and win the day. Star Scouts is sci-fi fun from page one. For most readers, it’ll remain just that. I think there are things to love about this book, but there are also areas for improvement. Let’s dive in. First, things I liked: it’s a book featuring a diverse main character – Avani is a rodeo-loving, Hindi-speaking adventure-seeker. Avani can be abrasive and impatient at times, but her sense of wonder and fairness balance that. And it’s just plain awesome to see a person of color as the honorary human at space camp! Following on that… space camp! Lawrence sets the scene with lots of futuristic bells and whistles (and a sci-fi take on typical camp activities). I also appreciated that the camp challenges relied not only on intelligence and training, but teamwork. Another bright spot is Avani’s new alien best friend Mabel. Mabel is a bit of a klutz and not so great at the badge challenges, but her heart and loyalty are portrayed as important as talent, and that’s a great message for readers. And I haven’t even covered the fun and inventive art yet! Yikes! Illustration is where Lawrence really shines. The colorful page spreads are full to the brim, and yet the sense of action and movement is palpable. I might not understand the rules of physics at Camp Andromeda, but I believed them! On to the things that struck me as problematic: first, there’s an implication within the first few pages that a group of Earth girls together would only be interested in makeup and boys, and that these interests mean that girls are vapid/stupid/not worthy of friendship. Granted, this is Avani’s view and she ignores the one person reaching out to her, but her perspective/judgment is not challenged in the course of the story. Secondly, once at Camp Andromeda, most of the action focuses on a girl vs. (alien) girl grudge match. Seeing both of those scenarios in the same story gave the book an anti-girl feel that wasn’t completely mitigated by awesome alien bff Mabel or the new Earth friend Avani made at the very end. There’s also a running fart joke (ah, middle grade lit!) at Camp Andromeda that is essentially identity-based name-calling. I get that it is included for humor’s sake, but the taunts are not addressed by those in authority or significantly challenged in the course of the story. So… yeahhhhh. Finally, an editing preference: there were many characters/creatures/robots included in the story – too many to focus on with any depth. These, combined with constant action and new challenges, resulted in a confusing smorgasbord. Star Scouts is a visually appealing read, but a crowded one. In all, Star Scouts is a beautifully illustrated space romp featuring a diverse main character. There’s some room for improvement in the empowering (all kinds of) girls department, but it should appeal to anyone who daydreams about adventure while stuck in the everyday. Recommended for: fans of Ben Hatke’s Zita the Spacegirl series, and anyone who likes middle grade lit, science fiction, and graphic novels (especially in combination). Star Scouts will be released by First Second (Macmillan) on March 21, 2017. Fine print: I received a finished copy of this book from the publisher for review consideration. I did not receive any compensation for this review.